Time: 6h15min (walking time without stops). Difficulty: the main difficulty could be the heat. Water: after Sant Aniol d'Aguja finding water becomes complicated. After Can Nou there is a drinking fountain, possibly dry, that does not inspire much confidence. Alternatively, when in Can Nou, you could always ask for water in the bar. (1h15min; 3,6 kms) Sant Aniol d'Aguja (446m). Here there is a drinking fountain in an ideal spot for camping and of course it is worth a stop to visit the Romanesque chapel of St Aniol by the ruins of the old refuge. Just by the fountain there is a path heading north - following the Riera de Sant Aniol - that goes to Gorg Blau (300m), a magnificent pool of crystal-clear water where you can go for a dip, and a little further on, to Salt del Brull (650m). 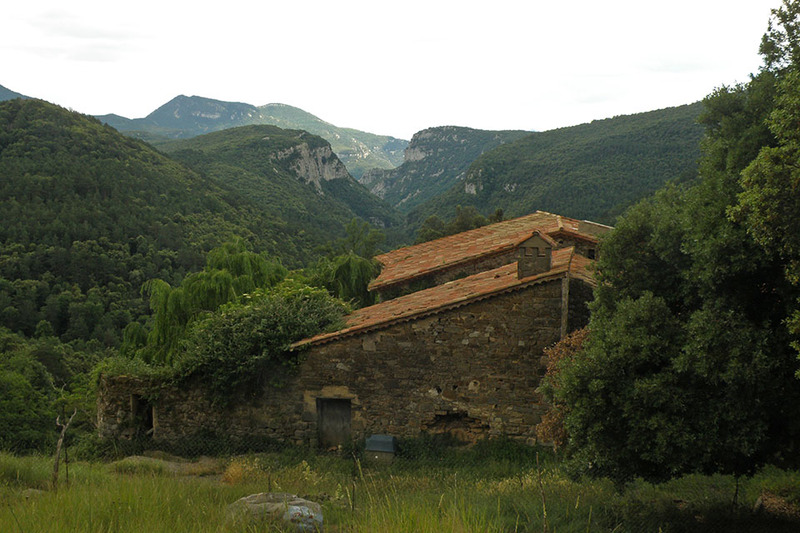 The tiny monastery of Sant Aniol d'Aguja was founded in the year 859 by a community of Benedictine monks. 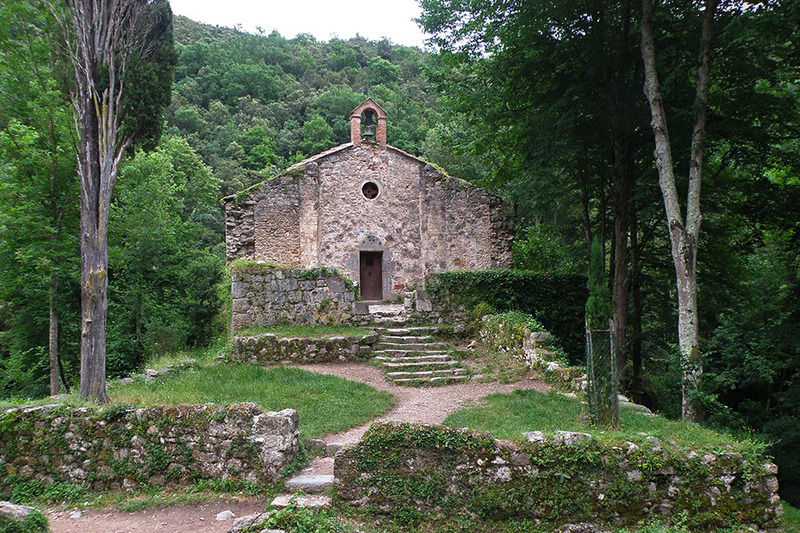 Due to its isolated position, it soon became dependent on Girona Cathedral and in 1003 the community transferred to Sant Llorenç del Mont, just a few kilometres from here. 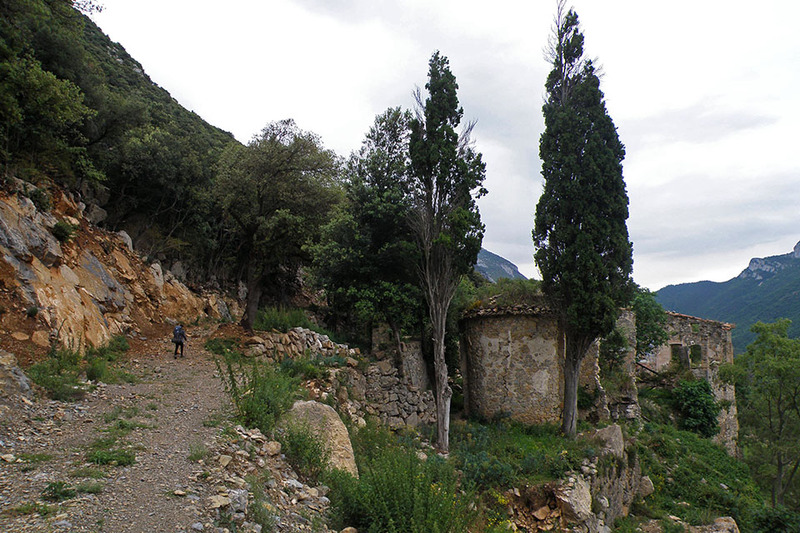 Close to the chapel stands the large building that once housed Sant Aniol mountain refuge. Volunteer groups from the area (Amics de Sant Aniol d'Aguja) are currently carrying out restoration work on the refuge, although it is difficult to know when this work will be finished. 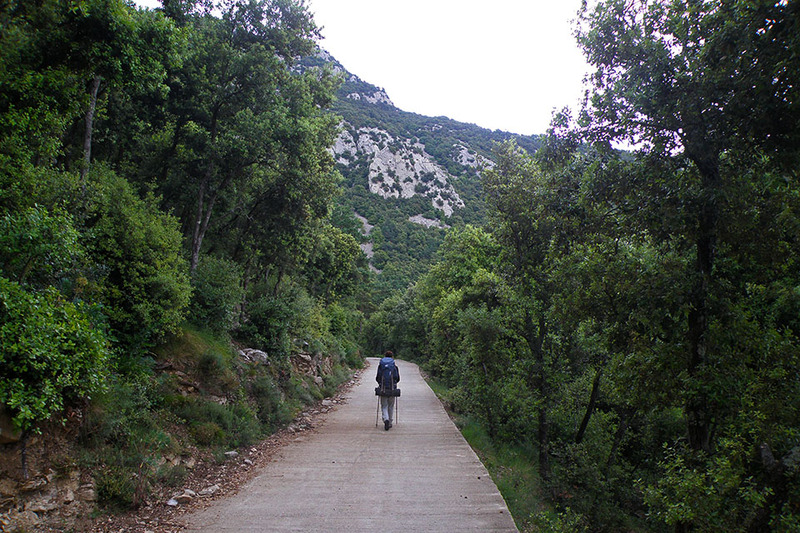 (3h50min; 9,9 kms) Coll de Bassegoda (1.102m). You begin to head downhill, and soon take a path on the left that drops quickly down to the Refugio de Bassegoda, which is closed and does not have a drinking fountain. You can ask for the keys to the refuge after another 7 minutes of walking, in Can Nou. 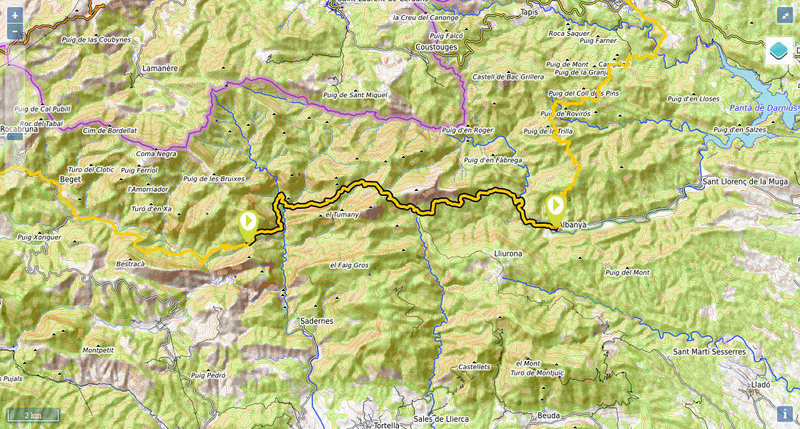 (4h25min; 11,5 kms) Can Nou (770m). 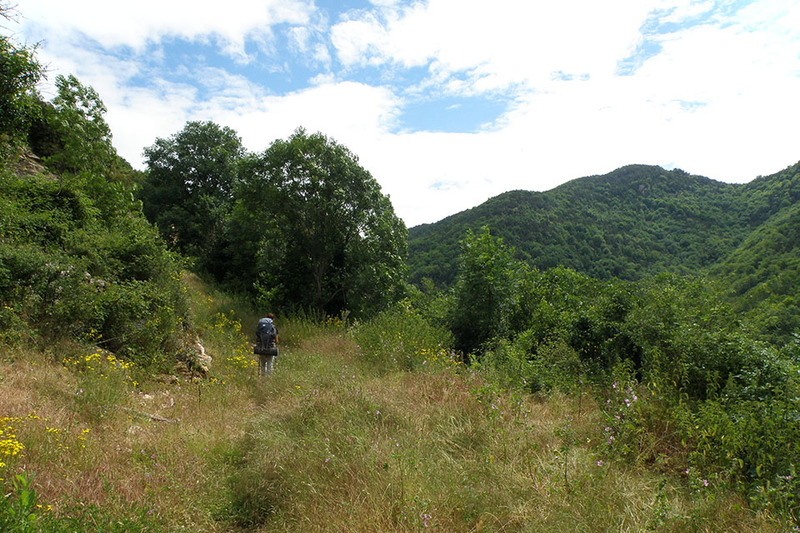 There is a gravel track that reaches this point from Albanyà, which soon becomes a cement track. As soon as you leave, you pass a drinking fountain (just a trickle of water, does not inspire confidence). 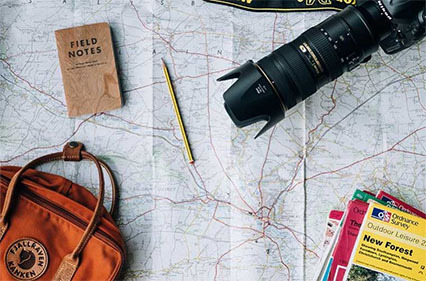 You could walk all the way down the track, although we prefer to follow the yellow and white markings of a local path that are more direct, bypassing several bends. The end of the stage is by track. 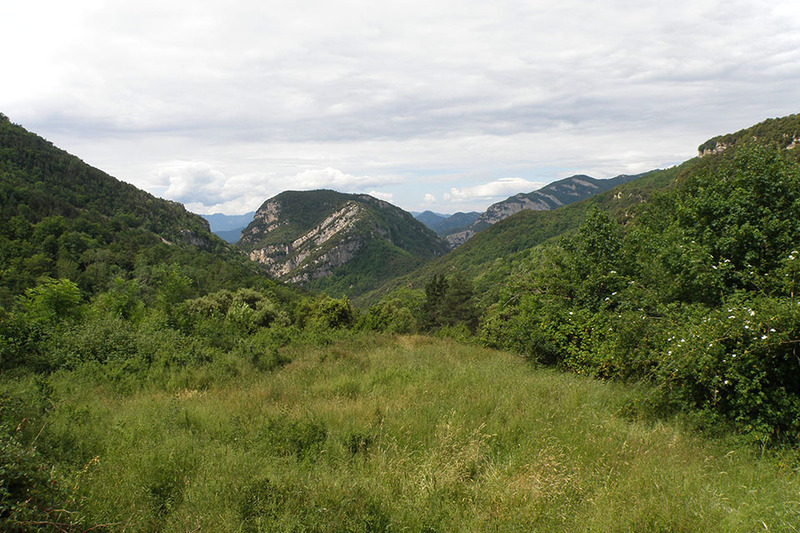 (6h15min; 19,3 kms) Albanyà (362m). 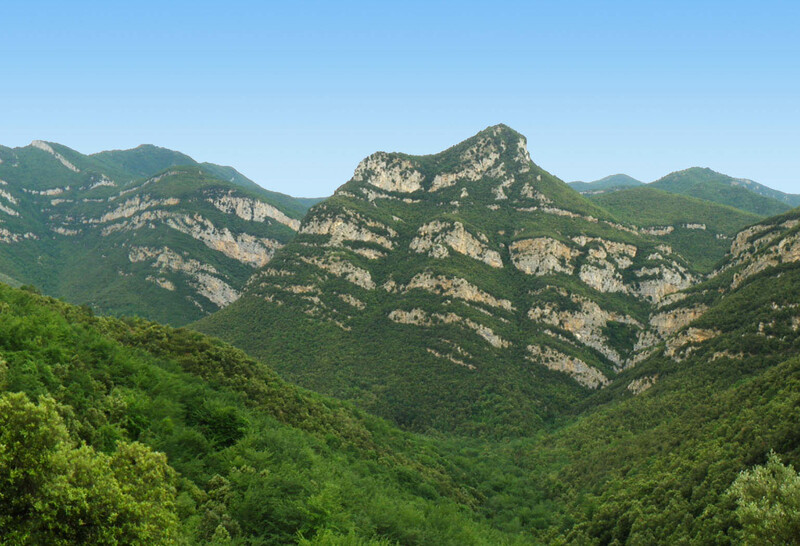 At Talaixàcol, you will find a shelter that is the property of the Centro Excursionista de Olot, a local hiking group. The building has a free area, La Casa d'en "Rodri" or Can Torner, which is made up of two rooms, a bunk bed and space for up to 8 people on the floor. In Sant Aniol d'Aguja, for now there is nowhere to sleep. The alternative would be to sleep in a bivouac. At around the half-way point, you will find the Refugio de Bassegoda. 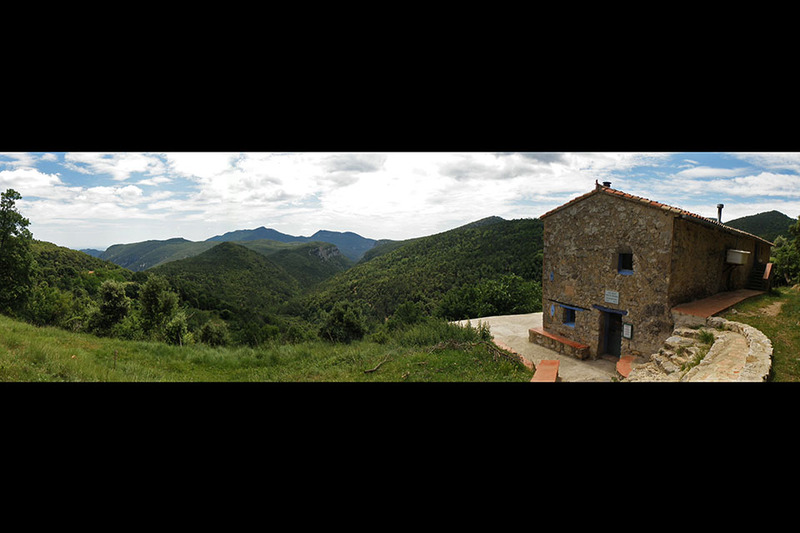 Ask for the keys in Can Nou (689 38 93 91), a 7-minute walk along the GR11 towards Albanyà. Can Nou offers bar service. The price of the refuge is 4€. 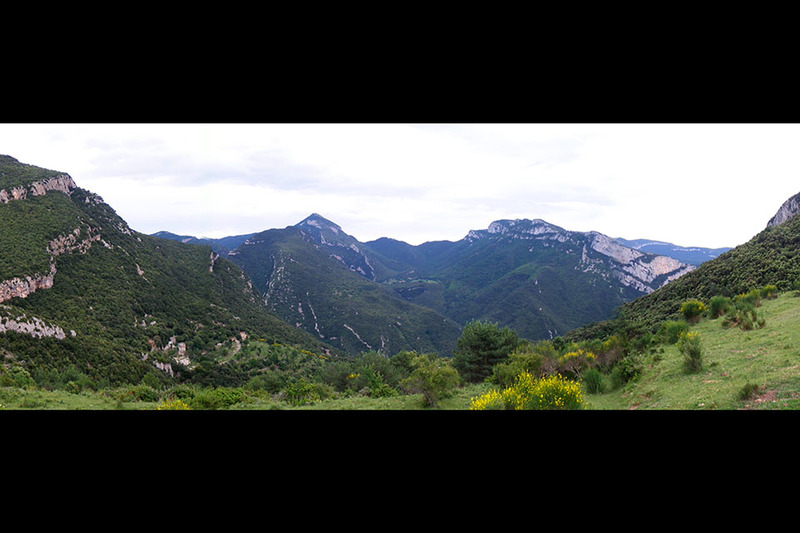 At the end of the stage, 1km before Albanyà: Camping Bassegoda Park. In Albanyà (centre): Albergue La Rectoría d'Albanyà. Can Nou offers bar service. In Albanyà, there is a small supermarket at the campsite and a grocery store in the village. There is a bus service that runs between Figueres and Albanyà (SARFA). Panorámica desde el collado de Talaixa. 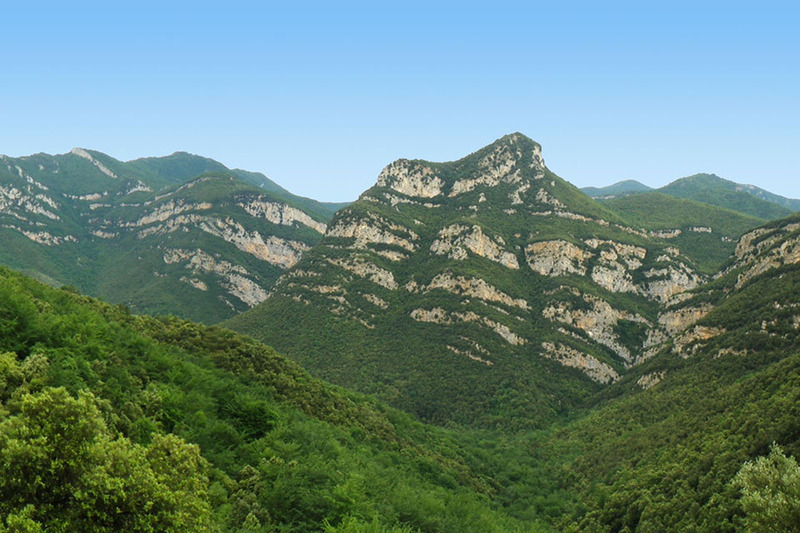 Destaca el Puig de Bassegoda (1374m). El Coll Roig bajo la mole del Martanyà.